All photographers know that early morning light and late evening light are magical: colours seem to liquefy and pool upon water, transforming it into a shimmering mass of quicksilver. Silhouettes are crisp and the world is gilded in gold. Early morning and late evening energy calm my soul; the energy is more subdued—the world is either just waking up or winding down for the night. It’s a sublime time to be outdoors with a camera as, almost always, something magical appears. Here are a few shots I took during magic hour this summer. 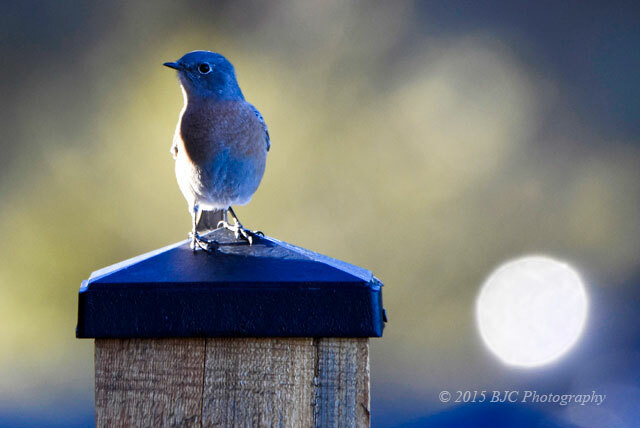 One of the things my partner and I were most hoping to see on our recent foray into wine country in British Columbia’s Okanagan Valley, was a Western Bluebird. While we get to enjoy the gorgeous Mountain Bluebirds which live here in Alberta, the beautiful Western Bluebird does not call Alberta home. We had never seen one of these little beauties before and we really wanted to catch a glimpse of one this trip. So imagine our surprise and great delight to discover that an entire flock of Western Bluebirds was roosting in the large Ponderosa Pine trees just outside our lovely accommodations in the Okanagan!